With over 112 miles of coast, there is no shortage of beach front in Virginia! Fortunately for us, much of it lies within Hampton Roads, and easy driving distance for a portrait session. Having specialized in beach session for over 5 years, I know them well! Today I'm sharing some of my favorite locations for beautiful beach photography in Hampton Roads. Sandbridge is a popular vacation spot for families, and especially for big family reunions. I shoot many extended family sessions on Sandbridge Beach every year. The beach is similar north to south, all lined with dunes and beach houses. Pretty much anywhere along Sandbridge beach is suitable for photography, but I love the area just south of Little Island Park for it's seclusion. Little Island Park itself is fun for a bit of variety, with the colorful condos and pier adding interest to the backdrop. It can be more crowded though, especially around holiday weekends. My least favorite area to shoot is the main drag at Sandbridge Road and Sandpiper, near the grocery. It's often crowded and the power lines detract from the sunset skies. I love shooting at the north end of Virginia Beach, which is residential. It is more secluded than the touristy boardwalk area, but still only about a 15 minute drive from most boardwalk hotels. In the summer months, I avoid shooting in the boardwalk area as it is just too crowded with foot traffic, trash cans, banners and other distractions. Parking can be tricky at the north end as many streets don't offer on street parking and enforce towing so it is best to plan ahead, especially in peak summer months. I love shooting at Fort Monroe because the beach is easy to access and the fort, just across the street, offers some awesome architecture and unique textures to add lots of variety to any session. The beach is smaller than the others, but the rocks add visual interest and there is always plenty of nearby parking. Sometimes crowded in summer months, I prefer to shoot here off season or on weekday evenings. These are just a few examples of some of the best beach locations available for photography sessions in Hampton Roads. Whether you are interested in engagement photos, family photography, senior portraits or the perfect spot for a beach wedding, there are tons of choices and I've only touched on a few. There are many more options to explore, so check back soon for more of this location series. Coming next...other awesome beach locations, urban sites, historic landmarks and more! Looking for tips on what to wear for your photo session? Find lots of helpful wardrobe advice here. A couple of weeks ago I began a series of posts that showcase some of the beautiful locations for photo sessions in Hampton Roads, VA. For Part Two of this series, I am sharing some additional park settings available around the area. (Click here for Best Locations Part One). When you schedule a photography session for family photos, engagement portraits or senior portraits in Hampton Roads, there are many options for where to shoot. One of the first questions I am asked is: "Where is the best location for photos?" The answer may vary depending on your hobbies, personal taste, and the time of year. Fortunately, Hampton Roads offers a wide variety of locations, so there are plenty of places to suit just about any purpose. This list will offer some helpful examples of what is available around the Tidewater area. A few things to keep in mind: the views will change depending on the season; even dog friendly parks require animals to be leashed; and all parks close at sunset. Oak Grove Lake Park is lovely all year. I especially love the golden hues in the late fall and the flowering wisteria in the early spring. This park features a walking trail that circles a lake, wooded areas and a playground. This park is dog friendly. I have included a number of photos at this location to show some variety throughout the year. Windsor Castle Park in Smithfield is a unique location in that it's the only public space that offers a rustic farm setting with several old barns, riverfront access, fields and wooded areas with walking trails. The park is quite large and offers tons of variety. This park is dog friendly and even has a dog park, though you need to be a resident of Smithfield to access it. Because of it's rustic, country appeal, Windsor Castle is quite popular in the fall and often crowded on weekends. The city does host events here on occasion, and part of the park can be reserved for weddings or other special events. Another favorite Hampton Roads park for photography is Mariner's Museum Park in Newport News. This park sits adjacent to both the Mariner's Museum and the Peninsula Fine Arts Museum with lake front access, as well as walking trails and bridges that wind throughout the wooded areas. You can hike for miles, and when the leaves change in autumn you may want to! However, parts of the trail are easy to access for shorter sessions or little ones who tire easily. As a bonus, the Mariner's Museum is offering $1 admission all summer! For more examples of some of the great park locations available for photography sessions in Hampton Roads, check out Part One of this photography location series. I have many options to share so check back soon for part three of this location series. Coming soon..., beach locations, urban sites and more! When you schedule a photo session for family photos, engagement portraits or senior portraits in Hampton Roads, there are a variety of options for session locations. After booking, one of the first questions I am asked by clients is: "Where is the best location for photos?" The answer may vary depending on your hobbies, personal taste, and the time of year. Fortunately, Hampton Roads offers a wide variety of locations, so there are plenty of options to suit any photo session. Since this question comes up so often in client consultations, I thought it would be helpful to put several ideas into a blog series for easy reference. Today I am sharing some awesome locations for a photo session in Hampton Roads in a park setting. This list is not exhaustive, but will offer some helpful examples of what's available. Keep in mind even dog friendly parks require animals to be leashed, and all parks close at sunset. 1. First Landing State Park: located in Virginia Beach, this park offers miles of walking trails, marshy waterfront areas and beach front property. There are two entrances, one off Shore Drive and one at 64th Street. This is a lovely location year-round, though in the summer months it can be very buggy in the wooded areas, and in the spring-fall some parts of the park can be inaccessible due to tidal flooding. I especially love shooting here in the fall. When the leaves change in early November, it's pretty spectacular. It is a popular spot for photography and is also dog friendly. There is a $5 fee to enter & park on site. Red Wing Park: located in Virginia Beach off General Booth Boulevard. Red Wing Park offers wooded trails, a lovely Japanese garden and gorgeous rows of Cherry Trees blossoming in the spring. There is also a rose garden and a playground area. This park is dog friendly and there is no fee to enter the park. Great Neck Park: This park in Virginia Beach is located off Great Neck Road. It's a smaller park than the other two, but still offers wooded areas, a gazebo overlooking the water, an open field and a playground. It's lovely year-round and is dog friendly. There is no fee to enter this park. Regent University: Centrally located near the border of Norfolk and Virginia Beach. Regent University is a beautiful private campus with well manicured gardens, green space and wooded areas. It is pretty year-round and offers some lovely variety all within a short walk. Regent does require a prior reservation and permission to use the premises and they charge a substantial fee for large sessions or anything longer than a mini. 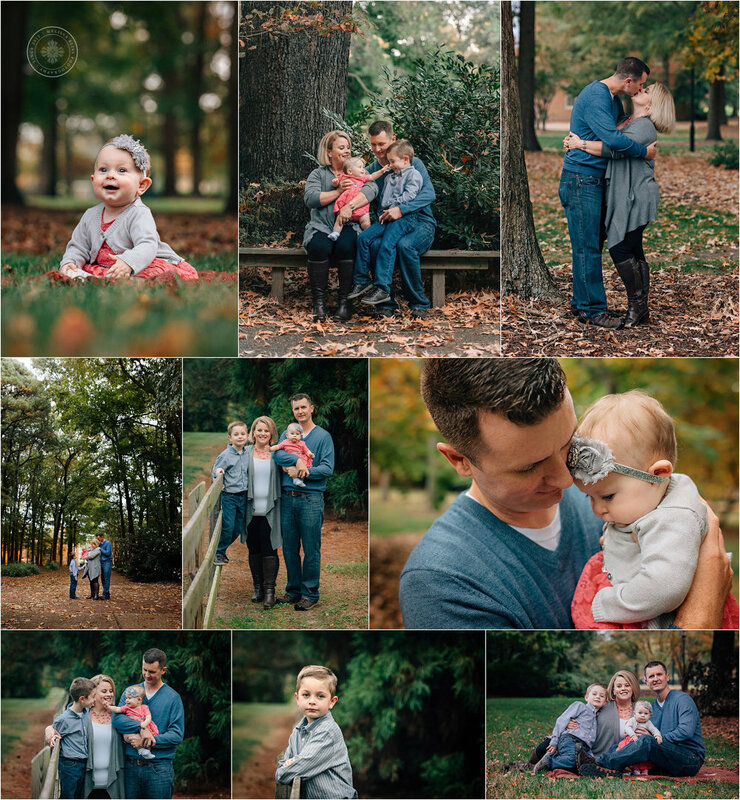 These are just a few examples of some of the great park locations available for photography sessions in Hampton Roads. There are many options so check back soon for part two of this location series. Coming soon...even more park areas around Hampton Roads, beach locations, urban sites and more!